As a teenager you learn new words, or new meanings for existing words. As a really mean example, a person may be referred to as ‘frigid’ – meaning they are really cold (in any sense of the term). 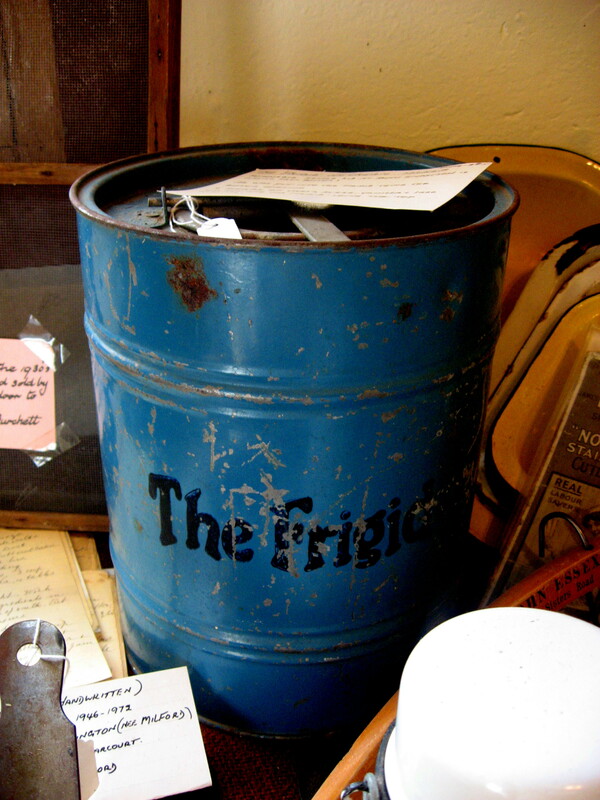 So recently, going through a country museum, seeing this particular piece, made me rethink the original ‘slur’ against someone who was referred to as ‘frigid’. The Frigid (as pictured above), was an ice cream maker. The Frigid had a removable sealed lid at both ends and ice was put into the Frigid using the bottom opening. A mixture of cream, sugar, vanilla, and one egg was put into the Frigid using the top opening, and voilà, the result was cold and frigid. !t’s not necessarily art, but it is curious, therefore I define it under my category of ‘Questionable Art‘ as part of ‘ ‘The Bad‘. You see, it’s not ‘Good‘ or ‘Ugly‘, but ‘Bad‘. This entry was posted in Collectibles, QuestionableArt, TheBad and tagged food, Frigid (ice-cream-maker). Bookmark the permalink. I am curious about which museum the Frigid was seen in. We also have one in our museum collection. I am wondering about its age. Thanks. Thank you. I am sometimes in that area so will cLl in and have a look. Much appreciared. I have one inherited from my mother who used it in the 50’s. You need to add salt to the ice in the outer part to freeze the ice cream mix. Hence the rust if not properly cleaned.The ice cream was mixed with a very early electric sunbeam mixer. I am thinking of putting it on gumtree if my family don’t want to keep it. Thanks for your comment. If it doesn’t sell, you might like to think about donating it to a local heritage museum which is where I saw this one.